So let's see. Where was I last time I remembered to post an update here? Quite a lot of progress has been made over the last few weeks. The van now has a new fusebox in the engine bay, new wiring from the battery and a whole new switch panel in the cab that actually makes things work when you operate the switches! (something of a novelty for my van). I've also got the new cabinet fitted in the back ready for the other fusebox and the connections for the leisure batteries. The inverter is in and almost all the cabling is in place and just needs connecting. One slight issue to overcome in that I seem to have failed to allow for anywhere to put the two large main fuses and a junction box. When you're dealing with 300amp cabling, they take up quite a bit of space. I think I've found room below the rear seat but I need to re-route some of the cabling I already laid in to sort it all out. Once that's done, I can hopefully finish wiring up the remainder of the electrical circuits. The back of the van is still leaking water in at quite a rate. This is despite some concerted effort to seal the useless rear rain gutter. I have no idea where the rain is getting in but there seems to be a lot of it behind the trim panels. I can apply more sealant to everywhere that looks likely but since the van has to live outdoors I need it to stop raining long enough to get everything dried out first and that seems to be a problem at the moment. The race car is currently stored in the dry but isn't likely to get any more use this year as I'm spending the money on other projects (mostly the van!). Nothing happening with the white spitfire either at the moment. 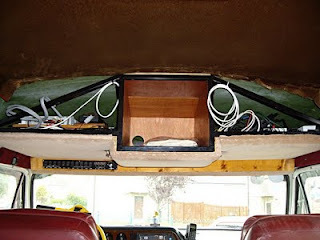 Here's a picture of the space above the cab in the van, with all the equipment now fitted and the new switch panel in the cab. Just to prove I'm not making all this up as I go along!